That was a significant takeaway from the California-Germany Bilateral Energy Conference 2017, held October 19-20 in Sacramento. 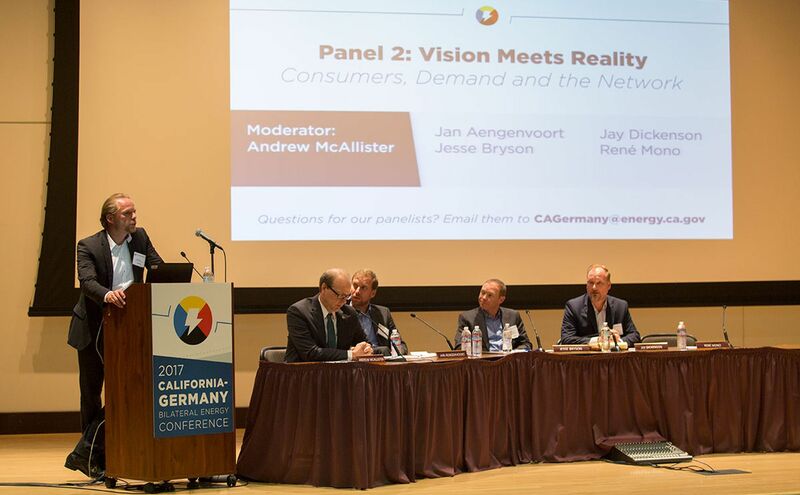 Sponsored by the California Energy Commission (CEC) and the German Federal Ministry for Economic Affairs and Energy (BMWi), the event drew a few hundred policy makers, industry people, and researchers, including counterparts brought over from Germany. CEC chair Robert Weisenmiller pointed out that the power sector is now responsible for only 19 percent of California greenhouse gas emissions. And that number is declining thanks to the ongoing growth of renewables, with legislation aiming at 50 percent by 2030. Transportation is now the largest source of emissions, accounting for 36 percent of the state total. Adding emissions from oil drilling and refining makes it closer to half, Weisenmiller added. In Germany, likewise, power sector emissions are dropping, falling 14 percent between 2007 and 2016 according to data from the German environment ministry. And like in California, emissions from other sectors have barely budged in Germany. Emissions from industry are unchanged over the past decade, falling slightly and then rising again. Transport sector emissions actually rose 8 percent. Overall emissions fell by 66 MMt in the past decade, with 56 of those MMTs from the power sector. California has been promoting low emission vehicles since the 1990s, and has a goal of putting 1.5 million electric vehicles on the road by 2025. It is currently home to 330,000 plug-in electric vehicles, accounting for half of all battery and plug-in hybrid electric vehicles in the US, and trailing only China worldwide. Using money from the cap and trade program, from the VW “dieselgate” settlement, from private companies, and from electric utilities, California has more than 10,000 Level 2 and 1,500 direct current fast charger (DCFC) connectors, according to Janea Scott of the CEC. The CEC is partnering with Oregon and Washington to build a West coast electric highway and is spending $20 million per year on hydrogen filling stations to serve fuel cell vehicles, with 30 stations built so far. “Prospects for meeting those air standards are dim, absent going to electric vehicles,” commented Nichols. Tesla, based in Fremont, California, and led by visionary Elon Musk, is the leader in luxury EVs, and is poised to be a major player in the mass-market with their new Model 3. Germany currently has 10,000 EV charging stations and 500 DC fast charging stations, according to Hanno Butsch of the National Organisation for Hydrogen and Fuel Cell Technology (NOW GmbH), along with 77 planned hydrogen filling stations. Speakers from both regions were bullish on the use of electric vehicle batteries to provide services to the grid, known as vehicle grid integration (VGI). With VGI, cars can be charged during very sunny or windy periods, soaking up plentiful renewable electricity. Then they can be discharged while parked, helping power the grid in other periods, follow the ups and downs of demand, and cut charges for customers. “There is no better marriage than electric transportation and the electric grid,” said Steve Berberich, CEO of the California Independent System Operator (CAISO), which manages the California power grid. Germany has done much more than California to encourage low-carbon heating sources, but is still seeing limited success. Germany has long promoted high-efficiency district heating systems. Aurubis, a copper manufacturer in Hamburg, is in the process of tying their waste heat output into the city’s district heat network, cutting 160,000 MWh of fuel consumption per year. But district heating systems, while very efficient, still tend to use fossil fuels. Using renewable and zero-emission sources for heat poses a number of difficulties. Increasing the efficiency of buildings is the necessary first step. But the big energy savings are in retrofits rather than in new construction, and retrofits are harder. Christoph Jugel pointed out that the energy renovation rate of buildings has been about 1 percent of buildings per year in Germany. DENA is trying to double that rate, such as through “mass customization,” a standardized approach that can cut costs. Another problem is that many heating technology purchase decisions happen during equipment turnover – a furnace fails in the winter, for example – and an urgent decision is made that tends to result in status quo replacements. The main low-carbon alternatives, like air source heat pumps or high-efficiency wood pellet stoves, are not easily “dropped in” to replace a gas furnace. An air-source heat pump works like a refrigerator, using electricity to drive compressors to move heat into or out of a building. But heat pumps account for only 2 percent of heat now, according to Dietrich Schmidt of the Fraunhofer Institute. He thinks Germany could get that up to 22 percent by 2030. The good news about electric heat is that wind power in northern Germany is correlated with heating needs in the winter. Cold winds off the North Sea drive demand for heating, and supply energy at the same time. To make progress, panelists agreed that success needs to spread from the power sector to other areas. “We need to electrify everything that moves and everything that doesn’t,” said SCE’s Ron Nichols.